When I wrote my short story collection, I mainly used a technique that I call ‘live writing’. Others have called it ‘writing in situ’. I went to a particular place to write. I usually did this longhand in a notebook. Sometimes I spent the day writing a first draft of a story, on other occasions I got some ideas down and wrote the story at home – this depended on the environment itself. I wrote the second and subsequent drafts at home, referring to images of the places I had visited. I started using this technique at Totleigh Barton https://www.arvon.org/centres/totleigh-barton (the Arvon centre in Devon) when the tutors asked us to watch something outside for 45 minutes. This was a revelation to me (aged 19) as I had never watched anything for that long, and hadn’t meditated or anything similar. I realised how much detail you get involved in if you watch something for an extended period of time. At Arvon we were simply watching – not writing. I watched a patch of nettles. I wrote afterwards. I began to understand that there was something about being in the environment itself that helped me to write. It wasn’t only the observation, it was also being immersed in the experience of being there. Most of the stories I have written using ‘live writing’ have been in towns and cities and weren’t – like my Arvon experience – about being thoroughly immersed in the natural world. However, nature does play a big part and I found that trees in particular were an unintentional theme throughout the collection. Again, unintentionally, most of my live writing excursions involved finding the natural world in an urban environment. I wrote at the Garden Museum in Lambeth, the College Garden at Westminster Abbey, in Chiswick Park, and in Kensington Gardens for instance. 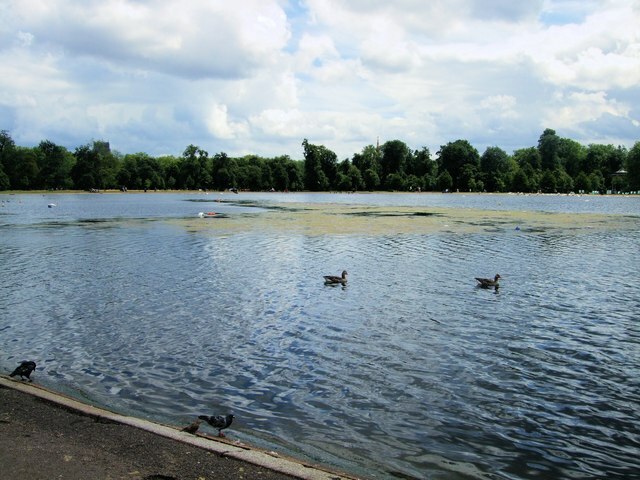 The Round Pond, Kensington Gardens, London, where I wrote ‘The Swim’. © Copyright Paul Gillett (licensed for reuse under the Creative Commons License). I had a few guide books to help me find my way to quirky locations in London. The stories aren’t all set in London, but it was where I was living when I started. I began writing my short stories this way a while back (in the early 2000s) – and there seem to be several more books about hidden or secret or unusual London now. Try searching with those key words and you’ll see what I mean! 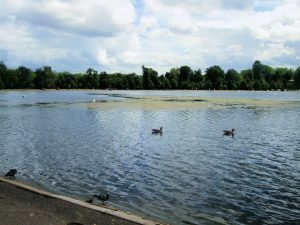 I also found sites such as London Walks (http://www.walks.com/ ) very useful. I named the whole collection ‘Unusual Places’ because of the way in which I set about writing the stories in the collection. The place had to have something unusual, secret, hidden or quirky about it. The place had to have access to tea and shelter from the rain. There had to be somewhere to write – at least a bench, for instance. This meant that I ended up writing in a lot of cafés, so cafés feature in the story somewhat. All of these are fictionalised. My favourite was the café in Red Ruth in Cornwall, with its cosy atmosphere and open fire place, which I think has since closed, and formed the basis of the story ‘Red Roof’ – of every fictional place I invented, I wish Red Roof was a real place! Now the collection is finished, I’m still using the technique to write. My most recent use of live writing was on a trip to the Cumbrian coast where I wrote on the train (it’s a long way from the South of England!). I find it very useful to write on a journey or an ‘adventure’ and to go somewhere I have never been before. I see this as a development of the live writing technique. I prefer to write short stories this way, rather than writing at my desk. Louise Tondeur, Sussex, March 2018. This entry was posted in local writing, short stories and tagged live writing, London, short stories, unusual places, writing. Bookmark the permalink.